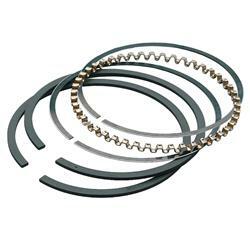 Re-freshen your tired short block with a set of these replacement piston ring sets for stock style pistons. These race series metric ring sets are the next best thing to the factory chrome faced top rings which are now obsolete. Easy to break in, and strong enough for any properly tuned turbo 2.3 application. Available in several bore sizes, please select your bore size below. These are made by Total Seal, a leading ring manufacturer in the industry and in our opinion the best quality 2.3 replacement ring manufacturer. Select Bore Size .020 over/3.800 inch .030 over/3.810 inch .040 over/3.820 inch STD.